Ah, adulting . . . The days are made up of paying bills, scheduling appointments, and maintaining that ever-so-tricky thing called "work-life balance." In the middle of keeping up with the day-to-day, it can be easy to forget about the future. Retirement? Eh, we’ll get around to it one day. Life insurance? We’ll think about it once we hit that certain age. But here’s the funny thing about life—you can’t control it. Things happen that we never see coming, and there’s very little we can actually plan for. That’s why it’s so important to have peace of mind with a life insurance plan in place. It doesn’t matter if you’re right out of college or knocking on the door of retirement: You need life insurance, and there’s no time like the present to get it. 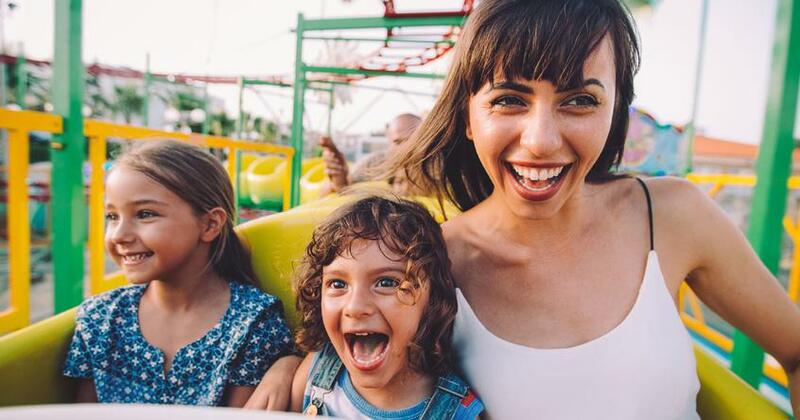 When it all boils down, you really have two options when it comes to life insurance—term or whole life. One is a safe plan that helps protect your family and the other one, well, it’s a total rip-off. Term life insurance provides life insurance coverage for a specific amount of time. If you or your spouse passes away at any time during this term (usually 20–30 years), your beneficiaries (those you’ve selected to inherit your money) will receive a payout from the term life insurance policy. Protect the people who depend on you the most with term life insurance. 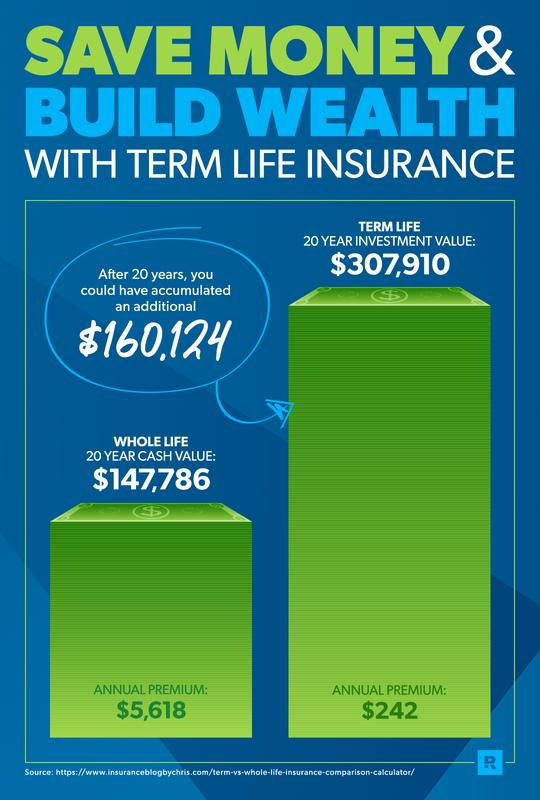 Term life insurance plans are much more affordable than whole life insurance. This is because the term life policy has no cash value until you or your spouse passes away. In the simplest of terms, it’s not worth anything unless one of you were to die during the course of the term. Then that’s when you receive money. 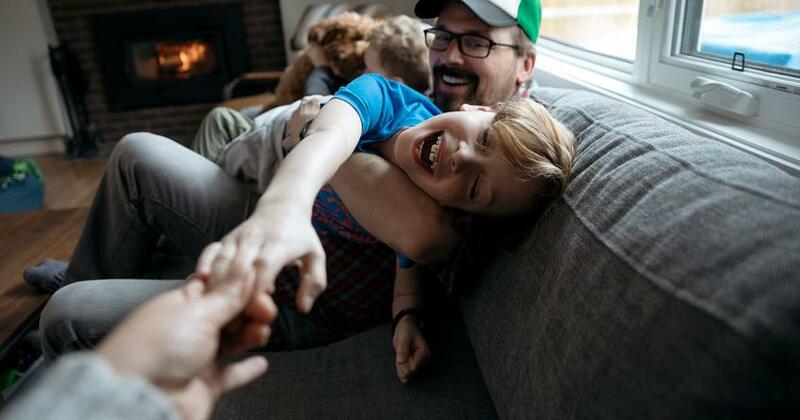 Of course, the hope here is you’ll never have to use your term life insurance policy at all—but if something does happen, at least you know your family will be taken care of. The premiums on whole life insurance (sometimes called cash value insurance) are generally more expensive than term life for a couple of reasons. Whole life coverage lasts throughout your entire lifetime. You might think it’s a good thing to have life insurance coverage for your entire life. But here’s the truth: If you practice the principles we teach, you won’t need life insurance forever. Ultimately, you’ll be self-insured. Why? Because you’ll have zero debt, a full emergency fund and a hefty amount of money in your investments. Whole life insurance costs more because it’s designed to build cash value. But keep in mind that a life insurance policy shouldn’t be an investment or money-making scheme—it’s simply meant to provide security, protection and peace of mind for your family should the unthinkable happen. It’s like Dave says in his book The Complete Guide to Money, "Life insurance has one job: It replaces your income when you die." There are far more productive and profitable ways to invest your money than using your life insurance plan. What sounds like more fun to you—investing in stock with a cutting-edge company or "investing" money in a plan that’s all based on whether or not you kick the bucket? We think the answer is pretty easy. Do I Need Life Insurance? Is Life Insurance Taxable? Should You Get No Medical Exam Life Insurance? What Is a Life Insurance Agent and Do You Need One? Let’s say a 30-year-old man has $100 per month to spend on life insurance. He shops around and finds he can purchase an average of $125,000 in insurance for his family. From the whole life insurance agent, he’ll probably hear a pitch for a $100 per month policy that will build up savings for retirement, which is what a cash value policy is supposed to do. However, if he purchases 20-year term life insurance with coverage of $125,000, it will cost him only about $7 per month instead of $100. So, if he goes with the cash value option, the other $93 per month should be added to his whole life insurance payout amount, right? Well, not really. You see, there are expenses . . . Worse yet, the savings he does manage to build up after being ripped off for years won’t even go to his family when he passes away! The only benefit his family will receive is the face value of the policy, which was $125,000 in our example. But what if he invested that $93 each month for 20 years? With a 10% rate of return, that would turn into about $70,000. Even better, if he invested for 30 years it would turn into over $200,000! Talk about a lot of bang for your buck! We recommend you purchase a term life insurance policy for 10–12 times your annual income. That way, your income will be replaced if something happens to you. And don’t forget to get term life insurance for both spouses, even if one of you stays at home with the kids. 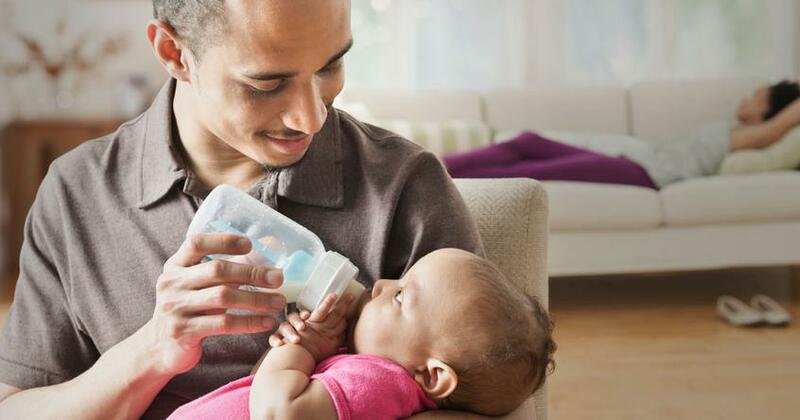 Think about what you would pay in childcare and home upkeep costs if the stay-at-home parent was gone! No matter what, you both need term life insurance. Want to make sure your family is covered no matter what happens? Check on your coverage before it becomes an emergency. Take our 5-minute coverage checkup to make sure you have what you need. How Long Do I Need Term Life Insurance? Dave recommends you buy a policy with a term that will see you through until your kids are heading off to college and living on their own. That might be anywhere from 20 years if you already have children to 30 years if you don’t have children or aren’t finished adding to your family yet. A lot of life can happen in 20 years. Let’s say you get term life insurance when you’re 30 years old. You and your spouse have an adorable little two-year-old toddler running around. You’re laser-focused on paying off all your debt (including the house) and look forward to investing and retirement planning in the future. Fast-forward 20 years—you’re both in your 50s and that little pint-sized toddler who would only eat chicken nuggets is now a 22-year-old college grad. The years went by fast, didn’t they? But look where you are! You’re debt-free (the house and everything), and with your 401(k), savings and mutual funds, you’re sitting at a cool net worth of $500,000 - $1,500,000! The years were good to you, and it’s all because you had a plan. Since you were able to build up your net worth, you have peace of mind. 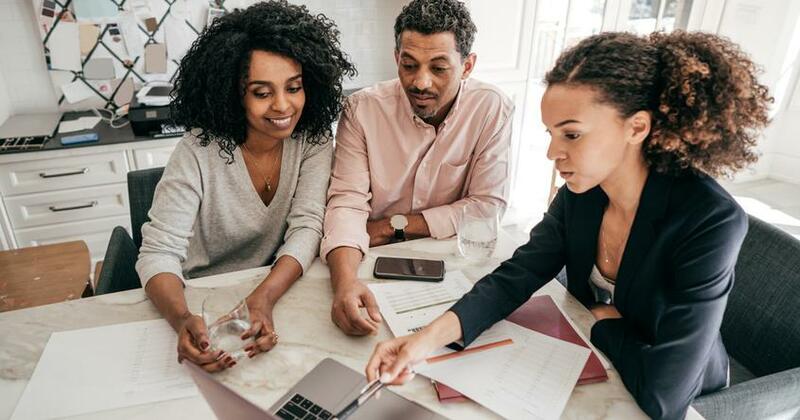 At this point, (even without life insurance) if something were to happen to you or your spouse, the surviving spouse would be able to live off your savings and investments. Congratulations, you’ve become self-insured! When you become more financially secure, you have less and less of a need for life insurance. The truth is, we can’t see the future and aren’t promised tomorrow. Life is precious! And the ideal time to buy life insurance is when you’re young and have a clean bill of health. Especially since life insurance companies are all about weighing the risks of the person purchasing the policy. The best time to buy life insurance is today! 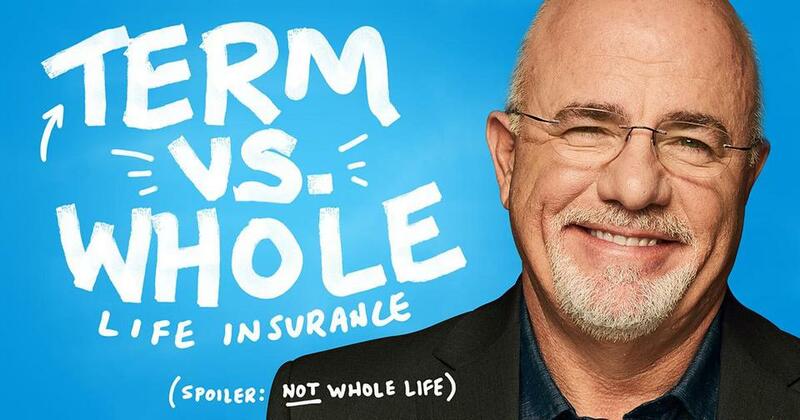 Zander Insurance is the only company that Dave Ramsey recommends for term life insurance. Don’t let another day go by without being protected by term life insurance. Start here to get term life insurance quotes from Zander now! If you’re wondering about life insurance and whether you even need it, we’ve got the answers for you! Normally, the payout from life insurance policy to the beneficiaries is not counted as taxable income, but there are some exceptions. Learn how taxes affect your specific situation. Should You Get No Medical Exam Life Insurance? Okay, so you know you need some life insurance, but ugh, those darn medical exams! We’ve got news for ya! You can skip the exams, but you’ll want to be careful and weigh all the variables first. What Is a Life Insurance Agent and Do You Need One? Confused about what makes a good life insurance agent and if you even need one? Find out in our guide!